I’m all about sharing productivity hacks for students. When I find something that works, I shout it to the rooftops. (Eh, I actually just write about it.) But I am also constantly on the lookout for productivity hacks that don’t work for students — or that don’t work in general — because I think it’s just as important to know what you shouldn’t waste your time on. 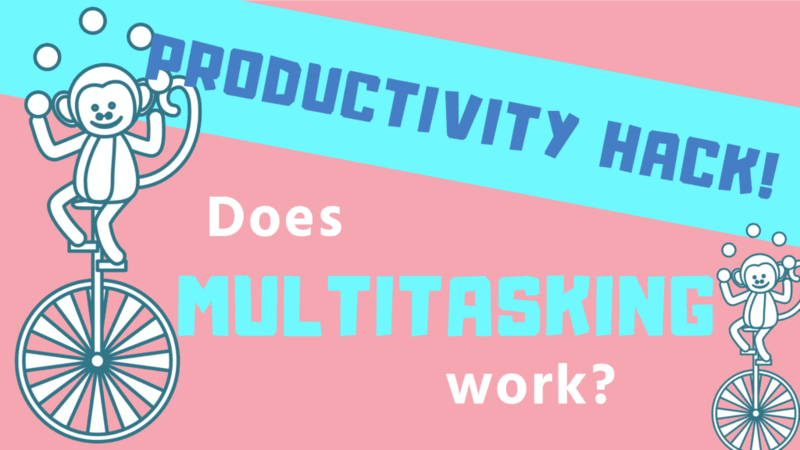 So the big question …does multitasking work? Is it a tool that actually helps us be more productive? I’ll cut to the chase: multitasking does NOT work. Neurologically speaking, it’s been proven impossible to effectively engage in two cognitively demanding activities at the same time. Sure, some people can walk and chew gum, but chewing gum isn’t exactly cognitively demanding. …You are not multitasking. (You’re not multitasking because as I said, this is impossible to do when the two tasks both require significant brain energy.) Instead, you are actually quickly switching back and forth between tasks — like a ping pong ball. Why is this bad? Because according to research, every time we leave a task and come back to it, we lose time in the transition. In fact, we can lose up to 40% of our time switching between tasks — even if the switching happens super quickly! Therefore, one of the best productivity hacks for students to start using, or stop using, rather, is multitasking. What should students do instead of multitask? Start and then completely finish a task before moving on to the next one. Work on task A for a set period of time, and then switch entirely to task B for a period of time. After a while, it’s okay to go back to task A. Repeat. If you’re a student, then this means it’s best to complete one assignment at a time, in a focused state, without other things going on in the background. So this means no conversations happening around you, no social media checks, no texting. (Oh so harsh.) In the end, when you fully commit to doing ONE thing at a time, you’ll end up spending less time overall on your assignment. And that’s the entire point of a productivity hack — right? Also — if you’re wondering which homework you should do first (the easy stuff or the hard stuff), here’s the answer.